Jay Stephens was born in Toronto, Ontario, Canada in 1971, and moved around a lot as a kid. Much of his youth was spent contemplating the wonders of movies, music, television, and comic books, without any undue criticism from the surrounding grown-ups, for which he is eternally grateful. Jay’s maternal grandparents lived in a very large old manor house in Brampton, Ontario where he always felt most at ease. They and his mother are British, and told many stories about ouija board seances gone awry, phantom photographs, and the haunted house across the street. Occultism, apparently, was the Warren family religion. Jay’s father, who left the family when he was 5, was a professional advertising photographer who had an ancient log cabin on several wild acres of land up near Gull Lake where he would take the boys every summer. Jay and his younger brother, Matthew learned to boat, fish, hunt, chop wood, and drive tractors and snowmobiles here, whether they liked it or not. Jay spent his Punk Rock adolescence in the decaying ghost-town of central Brampton before returning to the streets of Toronto on his own at the age of 17. During this period Jay was the drummer for several Punk bands (The Stiffs, Bad Day For Machines…) and played a few gigs in seedy Toronto clubs like Club Slither and Lee’s Palace. While making money as a muralist and selling hand painted T-shirts on the corner of Queen St. and John St. (in front of Much Music), Jay spent a year and a half at the Ontario College of Art, enrolled as a fine-art painter, but left to pursue a cartooning career in the early ’90’s when he started getting paid for it. He never looked back. Jay has written and drawn several of his own titles since starting out in the so-called ‘alternative’ comics scene in 1991, including THE LAND OF NOD, which many consider to be his best work to date. The series was nominated for the Harvey Kurtzman ‘Special Award For Humor’ in 1997 and 1998, and the Will Eisner Comic Industry Awards in 1998 (for ‘Best Limited Series’- The Land of Nod), and 1999 (for ‘Best Humor Publication’, and ‘Best Graphic Album: Reprint’- The Land of Nod Rockabye Book). The Land Of Nod is also significant in that it introduced future television stars JETCAT and TUTENSTEIN to the world. Work-for-hire has included ALIENS, BATMAN, FELIX THE CAT, STAR WARS, and TEEN TITANS, among others. Jay’s first weekly comic strip, ODDVILLE! was begun in 1994 for Seattle’s legendary alternative paper The Stranger by request of art director James Sturm, and later ran in Albuquerque’s Nu-City, and Montreal’s Vice for two years. The strip was revived as a full-color, half-page weekly in 2003 called WELCOME TO ODDVILLE!, and appeared every Thursday in the Toronto Star’s Brand New Planet section for a few years. In 1997, Jay Stephens created another strip called NOD that ran monthly in Exclaim! Magazine for three years featuring characters from his earliest, underground efforts. 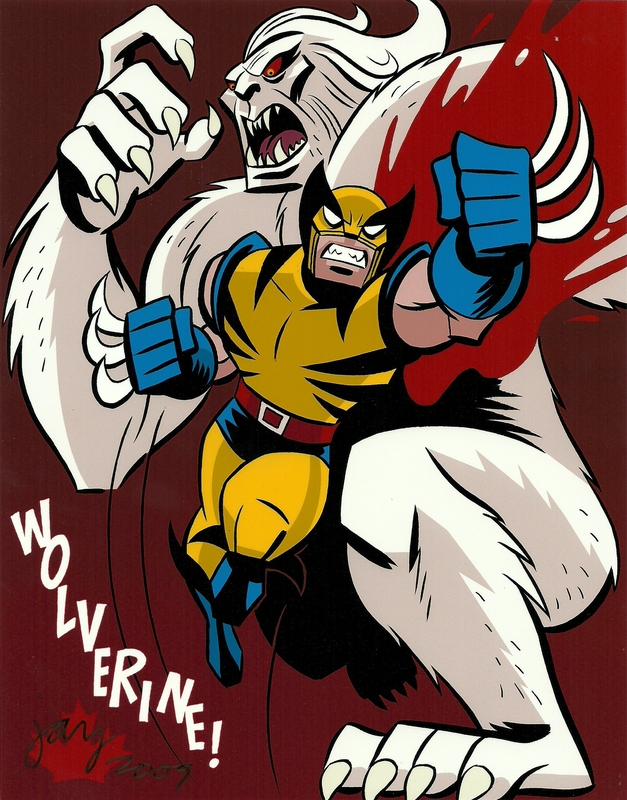 Jay was also one of the original cartoonists to contribute to NICKELODEON MAGAZINE back in 1994, and continued to showcase comics and illustrations in the magazine for many years. Various freelance comic strips and gags have appeared in YTV Whoa!, Slant, Owl, Scholastic, Star Wars Insider, and Too Much Coffee Man, among others. In 1999, Jay created a new children’s comic page for the 20th anniversary of chickaDEE Magazine, and wrote and drew the popular CHICK & DEE strip for five years, also contributing many covers, posters, puzzles and spot illustrations featuring the characters. Jay also created the new ‘summer special’ digest format which showcased longer form comic stories featuring Chick and Dee. For this work, Jay was nominated for a 2002 National Cartoonists Society Reuben Award in Magazine Illustration. Auction will include a digitally coloured print of the line art by Jay! Jay’s first experience with animation was for the short-lived YTV kids sketch comedy show, ‘Squawkbox’ in 1994, for which he was hired to write various live-action skits. Jay managed to slip in 8 cartoon shorts featuring a character called WONDERDUDS created by Jay specifically for the show. Jay was also the voice of the hapless title character! In 1999, Jay’s pint-sized comic book hero JETCAT made it onto the air in 4 shorts produced for Nickelodeon’s ‘KaBlam!’ cartoon anthology series. Jay was heavily involved in the writing, design, and art direction of this show, and fortunate to be nominated for the 1999 Annie Award for ‘Outstanding Individual Achievement for Production Design in an Animated Television Production’ for the pilot episode, ‘Sacred Identity’. Jay’s Emmy Award winning TUTENSTEIN show (based on another character from his comic books) premiered in the fall of 2003 on NBC Saturday mornings as well as throughout the week on Discovery Kids, broadcast around the world in several languages. A Tutenstein float in the famous Macy’s Thanksgiving Day Parade first appeared in 2004. 40 episodes and a TV movie have been produced to date. 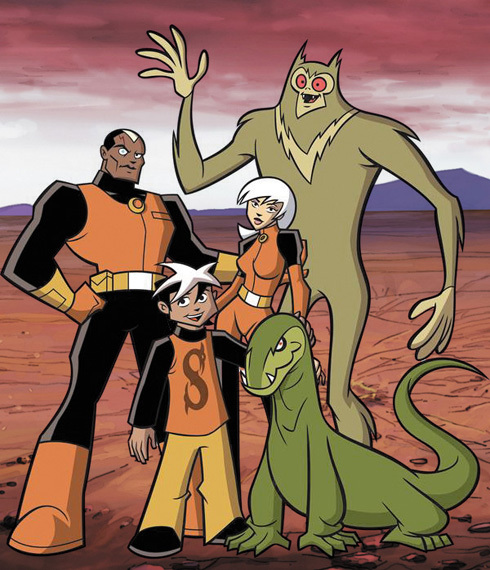 Jay Stephens is also the Creator, Art Director, and Executive Producer of THE SECRET SATURDAYS animated series for Cartoon Network, featuring a family of Cryptozoologists. Created specially for television, the series first aired in the Fall of 2008. Jay has also freelanced for Walt Disney Television Animation and Warner Bros. In 2004, Jay designed and co-illustrated the Chickadee EAT IT UP! cookbook for kids, written by Elisabeth de Mariaffi, and featuring the cast from Jay’s Chick & Dee comics. In 2007, Lark Books published three drawing instruction books called MONSTERS!, HEROES!, and ROBOTS! Written and illustrated by Jay Stephens. For his work on these books, Jay was nominated for a National Cartoonists Society Reuben Award in 2007. 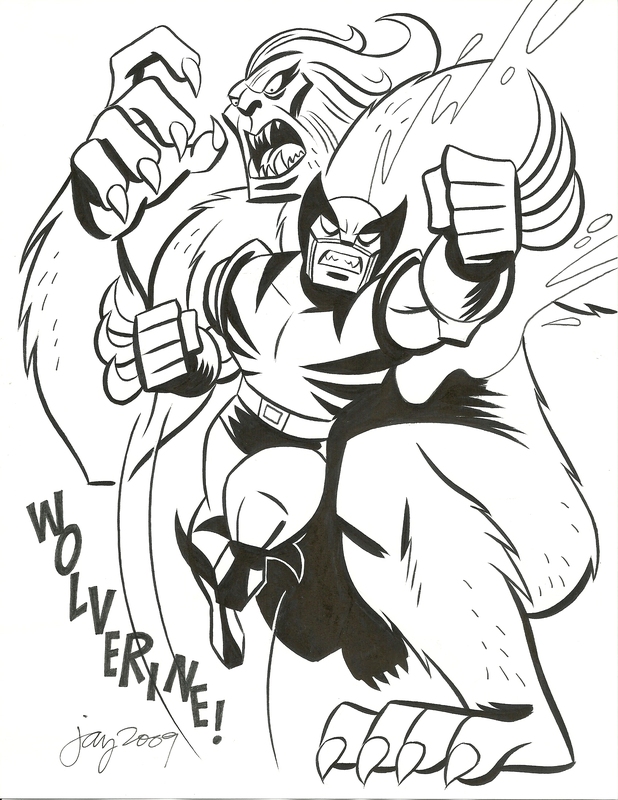 The piece shown above is one of over 40 pieces of original artwork featuring Wolverine donated to the Joe Shuster Awards for the Visions of an Icon Art Show and Sale by Canadian artists. The pieces were exhibited twice in 2009 – at the Joe Shuster Awards Ceremony in September and at the Speakeasy Comic Art Show in November. The original art pieces will be auctioned off on eBay in March 2010. Watch for announcements on this site! Every day we will try to post an original piece and some information on the artist(s) that donated the work. This entry was posted in Fundraising by Kevin A. Boyd. Bookmark the permalink.